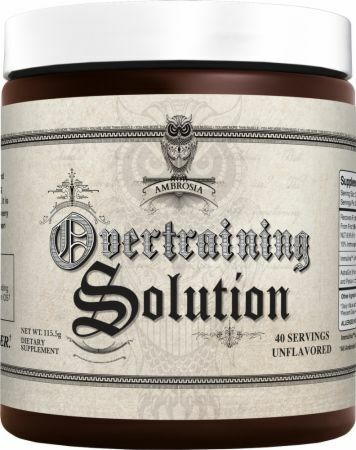 Overtraining Solution® is built to let you push yourself to the max, train frequently, and recover quickly. Our Recovery Fraction Peptides (RFP's) are uniquely formulated to provide an optimal balance between Proline Rich Peptides (PRP's) and Immunoglobulins (IgG, IgA, and IgM). No Overtraining Solution Reviews Found. * Daily Value and/or Recommended Daily Intake Not Established. Workout Days: Take Post Exercise or Intense Physical Activity. Mix 1 scoop in your post-workout shake or separately in 8oz water. Non-Workout Days: Take 1 scoop in 6oz water or mixed into a protein shake immediately upon waking. Warnings: This product is only intended to be consumed by healthy adults 18 years of age or older. Pregnant or nursing women should not use this product. Consult with your health care provider before using this product, especially if you are taking any prescription, over the counter medication, dietary supplement product or if you have any pre-existing medical condition including but not limited to: high or low blood pressure, cardiac arrhythmia, stroke, heart, liver, kidney, or thyroid disease, seizure disorder, psychiatric disease, diabetes, difficulty urinating due to prostrate enlargement or if you are taking an MAO-B inhibitor or any other medication, including but not limited to MAOIs, SSRIs or any other compunds with serotonergic activity.